A tie is an accessory that can embellish one’s overall look. Where a clean, ironed tie can make a person look smarter, a stained and crumples necktie can make him look gawky. A messy, grimy tie can worsen your impression. So, here we’ll tell you how you can keep your tie nice and tidy always. 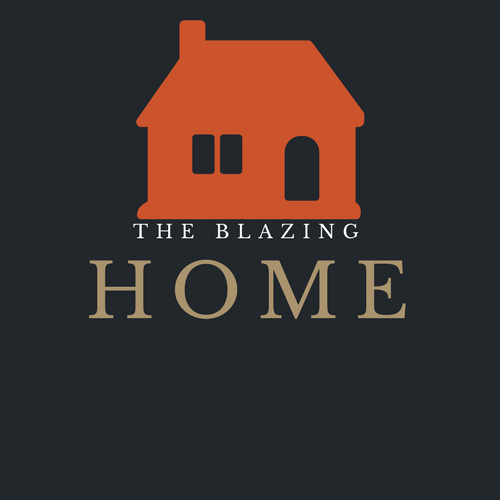 The Blazing Home will be talking about maintaining the ties clean and how to clean them if they accidentally get any stain. The cleanup method of a tie depends on various factors. You cannot throw a tie into a jar full of water and detergent every time you see a spot on it. A tie can get water staining too. That’s why I tried to include here every possible way you could wash out the blemishes. You’ll find them below. At first, you need to check what kind of spot or stain it is. Before you decide on soaking the tie in water, you need to think if the blemish can be spot treated or not. If yes, then spot cleaning is the best thing to do. If you spill sauce or any food item on the tie, you need to remove that from it immediately without letting it spread. Try not to remove the spill with water or fingers. Use a fork or a blunt knife to remove the spill as much as possible. Then, take a clean, dry cloth and press it on the stained area to absorb any residue of the item. 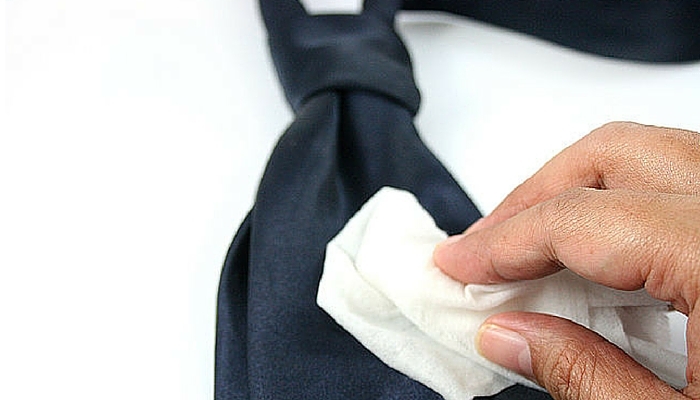 If you’ve spilled any liquid item like wine on your tie, firstly, dry it off with a clean napkin. Next, dampen a cloth or take club soda and use on it. The stain will go away with that. If you accidentally spill ink on the tie, you need to let it dry first. Otherwise, it will spread on the whole area. After drying it, use some rubbing alcohol n the stain. Repeat this process until you no longer see the spot. In case of oil based stains, use cornstarch or talcum powder to absorb the moisture. Let it sit like that for a few hours. The blemishes will go away. If after spot cleaning the stain remains there, you’ve to wash the tie. All sorts of fabrics are not compatible with hand or machine washing; some only can survive via dry cleaning. So, knowing the fabric type is necessary. If you don’t already know the fabric type of your tie, read the label on it. It will contain information. For Silk: Most ties are made of silk. You cannot wash silk with water because they get water stains and lose their shape in the water. You’ve to dry clean them. While dry cleaning, hand press the tie. For Wool: Woolen materials tend to shrink in hot water, heat, etc. If you stain a woolen tie, you have to dry clean it if the stain is too exposed. Try not to wring or twist a woolen tie as you cannot use an iron to make it flat again. For Cotton, Polyester, and Linen: Soak the tie in warm or cold soapy water and hand wash it after a while. Don’t squeeze it to remove the excess water rather you should press a towel or a clean cloth on it. For Knit and Seer Sucker: Wash the tie in cold water to remove any blemish. For Micro Fiber: Wash the tie in warm water. For any tie, use a towel to press out the excess water. Don’t try to squeeze out the water. Squeezing will ruin the shape of a tie. You’ll find instant stain removers in stores. If you’re that lazy person who doesn’t want to invest a lot of time in cleaning a tie, then you should opt for a stain remover. At first, you should test it on a portion of your tie to check if it damages or causes any discoloration to the fabric. Check this on an unexposed area of the tie. If this works fine, you can use it to remove any spots from the tie. If any of the above-mentioned ways don’t work out for you, consider going to a dry cleaner. Make sure the person is an expert in dry cleaning the ties. Telling them how you got the stains make it easier for them to clean the tie. Cleaning a tie isn’t an easy task to do. The better you maintain your ties, the less trouble you have to face. So, it’s better to keep them from getting dirty. You can have a tie rack so that you can keep your ties organized and flat. A great tie rack or a hanger is more capable of maintaining the shape of it. You can also roll them up and keep in a drawer to maintain the shape. When you’re home, the first thing you should do is remove the tie gently. Take a minute to loosen the knot and then removing it. If you wear it for long after returning, the chances of spilling something on it increase. When leaning towards anything that can produce stains, you should throw the tie around your shoulder. You can consider using a fabric protectant. It makes the fabrics resistant to stains and protects them. These are pretty much everything you should know when you are about to clean a tie. Always check the tie’s label for information. The labels almost always contain instructions on the cleaning methods of that material. This way you can keep your ties clean and elegant. If any of all these ways don’t work, consider buying a new tie or investing in a tie bar! I hope that helps!